I'm running a silver stain protocol and my lanes are dyed unspecificly with bands negativly stained and a smear across them. the gel is a gradient 5-10% acrylamide, with 0.1% SDS ambient (gel and running buffer). 1. 40% methanol+10% acetic acid for 30 min. 2. 10% methanol+5% acetic acid for 30 min. 3. rinsing X3 with water for 5 min. 4. 20µg/ml DTT solution for 10 min. 5. 0.07% (NH4)2S2O8 solution for 20 min. 6. 0.1% AgNO3 solution for 60 min. 7. 2% K2CO3 + 1.5% formaldehyde developer solution for 1-10 min. 8. stop solution 5% acetic acid for 5min. Casandra, thank you for your reply. non of proteins are crude lysates. and for the concentration issue, I have loaded 10µg per well and i'm sure that's not the reason for the smear. I've loaded befor up to 50µg per well and it worked fine. 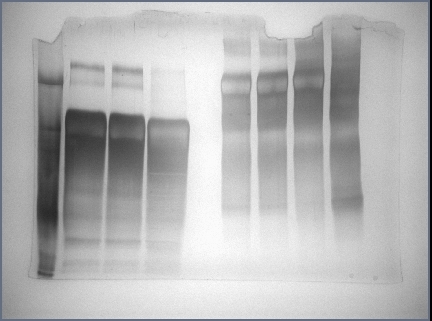 smears are usually caused by incomplete denaturation and aggregation of the proteins. i have found negative bands when over-washing after silver incorporation but you have no wash step listed before development (this might also cause background problems). i've also seen proteins that require a second round of staining (with silver, with and without destaining) before appearing. no aggregated protein are in the samples. the smear appears in all the samples and in both in the reduced and non-reduced samples. there is a washing step after the silver step before the developer step. it seems I did not write it down. but its a short rinse, for about one minute. we use a short rinse after silver incorporation, as well. we find that it must be performed as rapidly as possible or we get negative bands. also, silver stain is so sensitive that, even if not detectable by other means, it will detect minor amounts of aggregates. Sodiumthiosulphate incubation time is more, if you increase the sod.thiosulfate incubation time, the more back ground you will get. Normally exactly I used to keep exactly 1 min.